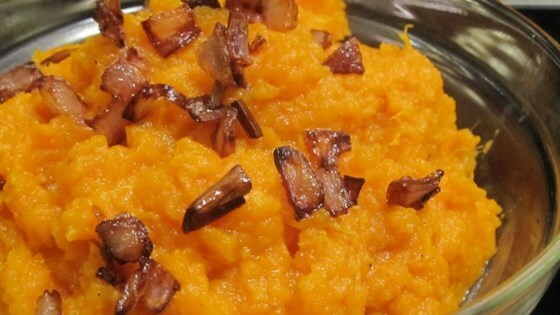 "These sweet potatoes are the best ever." Prick sweet potatoes with a fork. Bake for 1 hour or until tender; reduce oven temperature to 250 degrees F (120 degrees C). Scoop potato flesh out of skins and place into a mixing bowl. Slowly beat in the butter and cardamom. Whip until potatoes are smooth and fluffy; season with salt and white pepper. Keep warm in oven. In a large deep skillet, heat 1 inch of oil until shimmering. Add 1/2 of the shallots to oil and fry until crisp. Transfer the shallots, using a slotted spoon, to a paper towel; season with salt. Repeat the process until all the shallots are fried. Garnish top of potatoes with shallots. delicious!!! make extra shallots because people hog them - it was the only dish at thanksgiving that was completely gone. I liked the combination of flavors in this recipe. I am a fan of cardamon. However, I would simply fork mash the Sweets next time to give them a little more texture.